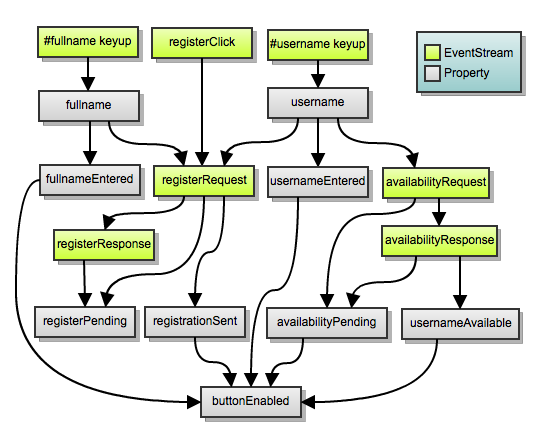 In my previous blog posting posting, I introduced a Registration Form application case study, and then hacked it together with just jQuery, with appalling results. Now we shall try again, using Bacon.js. It'll take a while, of course, but the result will be quite pleasing, so please be patient. We'll start from the very basics. This is how you implement an app with Bacon.js. So, we used the map method again. It's good to know that it's applicable to both EventStreams and Properties. And thenonEmpty function is actually already defined in the source code, so you don't actually have to redefine it. This relies on te fact that the onValue method, like many other Bacon.js methods, supports different sets of parameters. On of them is the above form, which can be translated as "call the attr method of the register button and use disabled as the first argument". The second argument for the attr method will be taken from the current property value. Actually, the last version of disabling contains a bug: since the negation of `enabled` is done inside setEnabled, the not() causes incorrect behavior. Unrelated to the Bacon. In Chrome the content table on the right jumping 1 pixel up and down instantly. Where is that defined? It seems like its the first time it was even mentioned. So is this just assuming that the dev would define that as a function? or is this a help function in Bacon.... sorry, when I learn things for the first time, it's hard to to take things quite literally. So... I've read this series of blog posts, the baconjs api, the FAQ, and... I still can't find the difference between a Stream and a Property. Some libraries (I'm thinking highlandjs in particular) treat everything as a stream. I'm guessing that "Properties" just hide boilerplate code from users.